This past weekend we had our first real storm of the season, and we weren’t prepared for it. 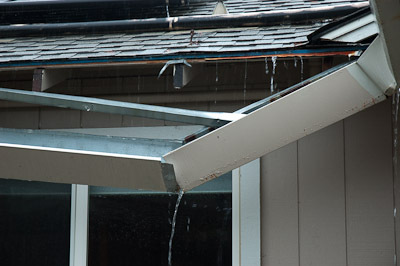 Our rain gutter, as the picture shows, did not quite make it through the first of the wind and rain. It looked like it was also going to pop right on through that bedroom window, and so we were out in the rain trying to remedy it. The lesson is that some things need to be dealt with before the storms come, or it becomes too late. Noah was able to rescue his family from the wrath of God because he began building the ark right away. Rahab put the red cloth outside her window immediately, even though she would have seen the attack from her window as the Israelites approached for battle. Esther called an urgent fast that the upcoming destruction of her people would be turned around by the Lord–and of course it was. Likewise, there are things we were created to do. And there are storms that are prophesied to come. As a follower of Christ I know that I am not called to live in the world, but to live in the kingdom of God within the world. And there are certain good works which Christ prepared beforehand for me to do–and for you too, whether you know about it yet or not (Eph 2:10). We can’t function in our purpose for God until we submit to God, love God, and hear God. Our greatest asset is time, and yet there is not enough time to waste. Storms are coming, so we should prioritize so that they don’t catch us by surprise.